Inspired by nature, Carved is designed to combine different textures with the same organic look and feel – perfect for creating individual flooring installations. 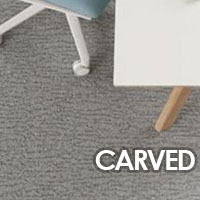 DESSO’s Carved carpet tile range replicates the chiselled textures of classic woodwork designs, this intricate pattern gives plenty of room to experiment with. Available in ten muted colour options, from anthracite greys and blacks to lighter shades of brown with golden hues, Carved provides a neutral and calming backdrop for workplace environments.